Short & Sweet by Gabor is an expertly layered, short cut with a hand-knotted top for varied parting choices. This smart silhouette can be styled tousled, smooth or somewhere in between. The Personal Fit™ cap creates a custom fit as it molds to the shape of your head. Open wefting in the cap allows for better air ventilation, making it more cool and comfortable to wear. 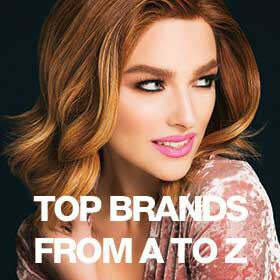 And the ready-to-wear FlexLite® synthetic hair looks and feels like natural hair. Short & Sweet is part of the Gabor Spring 2014 Wig Collection. Hand-knotted Top – Though not a monofilament, it creates the appearance of natural hair growth and allows for styling versatility. Personal Fit™ Cap – Utilizes a stretch material that molds to the shape of the head for a lighter, more comfortable and secure custom-like fit. FlexLite® Synthetic Hair Fiber – Ready-to-wear, pre-styled and both fine and lightweight to better replicate human hair. Salon Inspired Luminous Colors – Offer multi-dimensional shades, subtle depth and natural looking highlights. Velvet-lined Ear Tabs and Velvet-lined Extended Nape – Protect skin from friction. Ultra-thin Adjusters – Provide a better fit and added comfort. Front: 2.5" | Crown: 3.5" | Sides: 2.25" | Back: 3" | Nape: 2.25"